The epidermis, the surface layer ofthe skin (figure 22.1), is composed of layers of squamous epithelial cells and ranges from 0.007 to 0.12 mm thick. The outer portion is composed of scaly material made up of flat cells containing keratin, a durable protein also found in hair and nails. The cells on the skin surface are dead and, along with any resident organisms, continually peel off, replaced by cells from deeper in the epidermis. 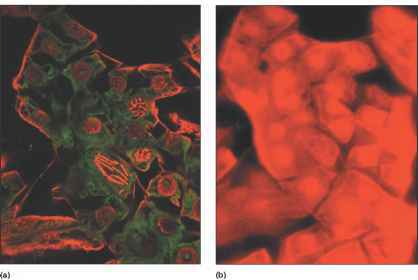 These cells, in turn, become flattened and die as keratin is formed within them. This process results in a complete regeneration of the skin about once a month. Dandruff represents excessive shedding of skin cells, but mostly the shedding process is unnoticed and represents one of the skin's defenses against infection. The epidermis is supported by the dermis, a second, deeper layer of skin cells through which many tiny nerves, blood vessels, and lymphatic vessels penetrate. The dermis adheres in a very irregular fashion to the fat and other cells that make up the subcutaneous tissue (see figure 22.1). Fine tubules of sweat glands and hair follicles traverse the dermis and epidermis (see figure 22.1). Since sweat is a salty solution, high concentrations of salt occur as it evaporates. Evaporation of sweat and regulation of the amount of blood flow through the skin's blood vessels are critically important in controlling body temperature. Sebaceous glands produce an oily secretion called sebum that feeds into the sides of the hair follicles. This secretion flows up through the follicles and spreads out over the skin surface, keeping the hair and skin soft, pliable, and water-repellent. The hair follicles provide passage for certain salttolerant bacteria to penetrate the skin and reach deeper tissues. 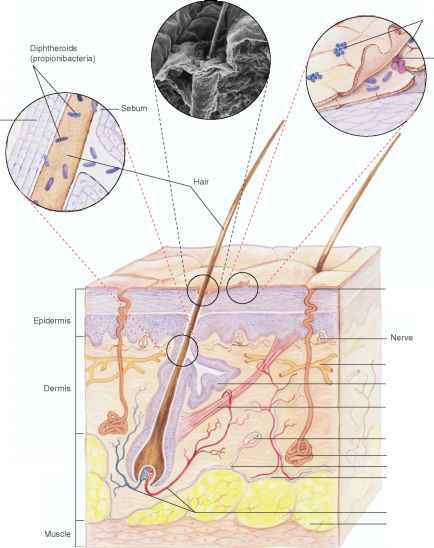 Figure 22.1 Microscopic Anatomy of the Skin Notice that the sebaceous unit, composed of the hair follicle and the attached sebaceous gland, almost reaches the subcutaneous tissue. Junction of dermis and subcutaneous tissues Blood vessels Fat supply water, amino acids, and lipids, which serve as nutrients for microbial growth. The normal pH of skin ranges from 4.0 to 6.8. Breakdown of the lipids by the microbial residents of normal skin results in fatty-acid by-products that inhibit the growth of many potential disease-producers. In fact, the normal skin surface is an unfriendly habitat for most potential pathogens, being too dry, salty, unstable because of shedding, acidic, and toxic for their survival. Why is the skins surgace unfriendly to oathogens?